I have tried to keep this section on watercolour art materials as simple as possible with the general principle of quality rather than quantity. brushes which don't form a natural point or hold enough paint. So many children are put off by those huge boxes of paints their well-meaning elders buy for them in which 30 or 40 colours sit looking seductively like sweets. When applied with the supplied brush which is a bit like a minute shaving brush, onto thin paper, the effect is depressing. If you have had to do this, you will find that working with better materials is a revelation. Paper for paintings should be heavy with lots of rag in it. I recommend Fabriano Artistico 300gsm, Cold (or Not) pressed paper. Bockingford papers are also very good. The Fabriano paper is well sized, which means that it has been lightly coated with a glue which makes it absorb less paint. This allows you to lift off paint easily and scrub out mistakes. The paint also goes a lot further. An assortment of soft pencils 2B, 3B and 4B for sketching. A round brush, Prolene, size 12 will do just about everything, from large washes to small details. If you want something more, a half inch square-ended brush will do everything else. Unless that is, you find you are working a lot with Winsor & Newton or Rowney masking fluid, which is used for making whites. 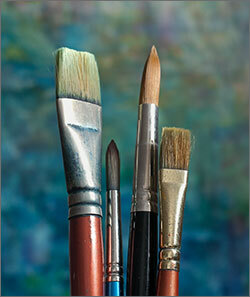 You will need a large number of very cheap watercolour brushes here and these can be found in your local DIY shop. 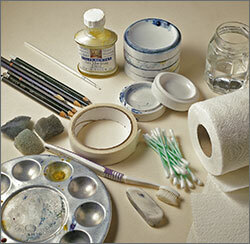 See the section on painting white in the FAQ section for the best tip of all on this subject. the colours of the pure spectrum. These colours are also pretty permanent - a lot of watercolours fade quite rapidly. If you want to experiment with different ones, look carefully for the permanence rating on the tube or pan. It doesn't matter whether you use tubes or pans, both have advantages and defects - I use both. 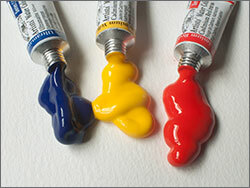 Cadmium Red are the three basic primary colours. However if you were to attempt to paint a rainbow using just these three, you would get some very muddy greens and purples and you couldn't get any sort of turquoise. Phthalo Blue (which Winsor & Newton call Winsor Blue). You should be able to paint a good rainbow with these. A very important consideration is to get artists' quality colours. Students-quality paints are highly diluted and are no economy. If you want to make lots of small white marks - masking fluid and a tube of Titanium White guache which makes a stronger white than watercolour white.